A 16th century illustration of the Gospels, "From Hell, Epulo appeals in vain to Abraham." On the land above, at the rim of the pit, are serpents. 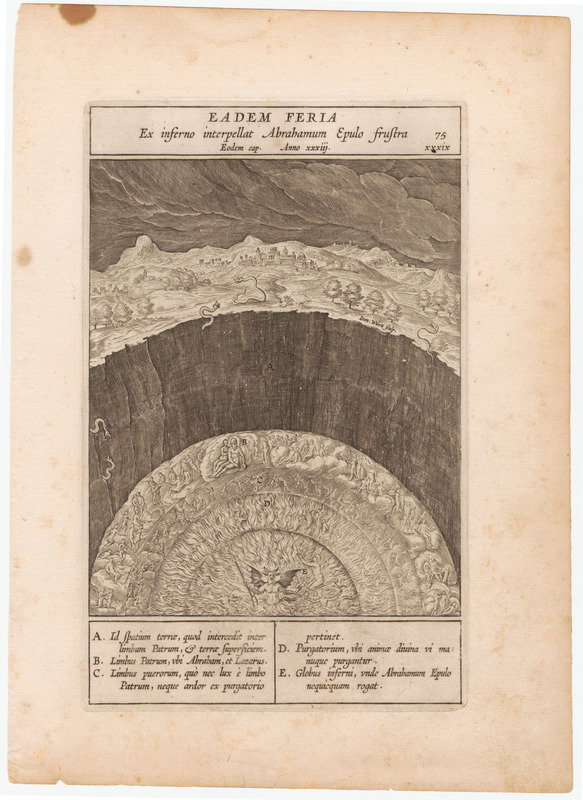 The geography of hell is illustrated, including Limbo, Purgatory, and the Sphere of Hell with the devil at the center. Date is estimated; may be from a later edition. Natali, Hieronymo. 1596. Evangelicae historiae imagines, ex ordine Evangeliorum, quae toto anno in Missae sacrificio recitantur, im ordinem temporis vitae Christae digestae. Antwerp: Martinus Nutius.